Learn to create Windows applications using Visual Studio Community 2015. 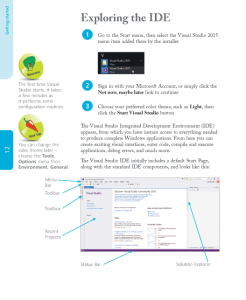 Code examples, screenshots, and step-by-step instructions illustrate each aspect of Visual Basic, so you'll be creating your own interactive applications in no time! View and download first chapter and Table of Contents - FREE! Visual Basic in easy steps, 4th edition shows you how to quickly create Windows applications using the latest free Visual Studio Community 2015 programming environment. 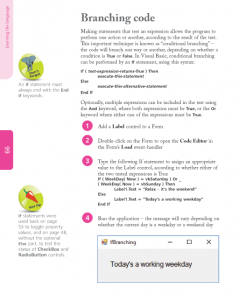 This book gives you code examples, screenshots, and step-by-step instructions that illustrate each aspect of Visual Basic. 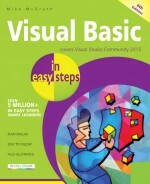 Visual Basic in easy steps, 4th edition begins by describing the Visual Studio Community 2015 installation process, then introduces form controls, application properties, the programming language, and problem-solving techniques. 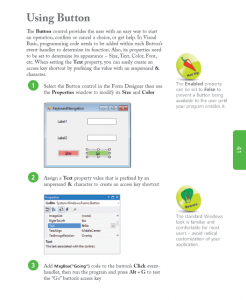 Next, the book illustrates by example, how to build and deploy a complete Windows application. A chapter is devoted to scripting with Visual Basic. This first shows you how to create 'macros' for Word and Excel in Microsoft Office, using Visual Basic for Applications (VBA), then demonstrates how to manipulate files and data within the Windows operating system using VBScript. You will learn how to incorporate external data into your applications from text files, Excel spreadsheets, XML documents, live RSS web feeds, and SQL databases. You need have no previous knowledge of any programming language so it's ideal if you're a newcomer to Windows programming. Each chapter builds your knowledge of Visual Basic. By the end of this book you will have gained a sound understanding of Visual Basic programming and be able to create your own interactive applications. Visual Basic in easy steps, 4th edition has an easy-to-follow style that will appeal to anyone who wants to begin Windows programming. It will appeal to programmers who want to quickly learn the latest Visual Basic techniques, and to the student who is studying computing at school or college, and to those seeking a career in Information Technology who need a thorough understanding of Visual Basic programming.